UPDATE: The Crystal Ball‘s Geoffrey Skelley spoke with Paul Brandus of West Wing Report about this article. To hear the audio, click here. Perhaps Pennsylvania Senate Majority Leader Dominic Pileggi (R) should be nicknamed the “The Electoral College Count von Count” for his different ways of trying to count electoral votes. Much like the Sesame Street character, his fixation on counting can be both grating (to not only his political enemies, but also some of his political friends) and instructive. After his inability to push the Keystone State version of an electoral vote-by-congressional-district plan, Pileggi proposed a new bill that would proportionally allocate Pennsylvania’s electoral votes based on the statewide popular vote. Considering that Barack Obama won Pennsylvania by a little more than five percentage points while winning 100% (all 20) of the state’s electoral votes, Pileggi’s latest proposal is partisan, just like his previous plan. Because the Democratic presidential candidate has won the state in every presidential election since 1992, Republicans would love to win some of the state’s electoral votes even if their presidential candidate can’t win a plurality in Pennsylvania. Democrats see the proposal as a ploy to game the system, and we also get the sense that many Republicans would just as soon let the issue of changing Electoral College allocations go away, given its potency as a rallying cry for Democrats. Any change to how electoral votes are allocated would make more sense if adopted nationally, as opposed to a piecemeal approach (that includes Maine and Nebraska, whose unique apportionment by congressional district gives ammo to those who wish to game the rules in other states). But unlike the proposal to award electoral votes by congressional district — a plan that the Crystal Ball’s Alan Abramowitz found would have elected Mitt Romney in 2012 even though President Obama won the national popular vote by about 5 million votes — a proportional allocation system, used nationally, might track more closely to the national vote than the current system. We will tackle what could happen if electoral votes were awarded proportionally in every state, but first an explanation is required to clarify just how the proportional system would work. 1) Whichever candidate receives a plurality of the state’s vote wins two electoral votes. 2) The remaining electoral votes (18 for Pennsylvania in 2012) are then divided among the candidates based on the proportion of the state’s popular vote each won, with the electoral vote total rounded up to the nearest whole number. That means, for instance, that 1.1 (or 1.001) is rounded up to 2, not to 1. 3) Should the rounded-up electoral vote total add up to more than the state’s total number of electors, “the number of presidential electors allocated to the nominee with the smallest percentage of the statewide popular vote shall be reduced by one.” This “subtraction phase” (as we’ll refer to it) is then repeated until the total is right, going from the last-place candidate to the second-place finisher. The first-place finisher in the state cannot have his or her total reduced in the subtraction phase. Using Pennsylvania in 2012, let’s demonstrate how this would work. Overall, Obama won 52.0%, Romney won 46.6% and the remaining candidates each won less than 1% apiece. First, Obama gets two electoral votes for winning the state. Next, multiplying .520 by 18, we get 9.4, which when added to two gives Obama 11.4, which is then rounded up to 12 electoral votes based on the bill’s language. As for Romney, we multiply .466 by 18 and get 8.4, rounded up to nine electoral votes. But because 12 plus nine equals 21, we must reduce an electoral vote to get to Pennsylvania’s elector total of 20. So starting with the lowest finisher who has an electoral vote, we subtract one from Romney’s total, making the allocation Obama 12, Romney 8. Now, what would 2012 have looked like nationally under this format? Chart 1 shows how the electoral votes would have been apportioned according to the proportional plan. Note: The “O” or “R” in the “State winner” column signifies whether Obama or Romney won the state. Source: Electoral vote calculations based on election data from Dave Leip’s Atlas of U.S. Presidential Elections. Based on this hypothetical scenario, President Obama still would have won the 2012 election, but he would have only received 282 electoral votes. That is 52.4% of the 538 available electoral votes, which closely mirrors the 51.0% of the national popular vote that Obama won. In real life, Obama captured 332 electoral votes, or 61.7% of all electoral votes. Romney would have won 255 electoral votes, and Libertarian Gary Johnson would have earned one electoral vote in California. Thus, the main appeal of this proposal is that it could conceivably make the Electoral College total more closely reflect the national popular vote outcome, provided that it was used in all 50 states (plus Washington, D.C.). Readers can try out this method, and other ways to allocate electoral votes, at 270towin.com. But what are the other ramifications of this system? Most notably, it would significantly affect large states. The states with four electoral votes or less would have still ended up awarding all of their votes to the candidate who won their states. For states with between five and 10 electoral votes, most would still award the vast majority of their electoral votes to the statewide winner, although the minority party would scrape away a few electoral votes in each state. However, this formula disproportionately influences the Electoral College results of more populous states. In 2012, Obama beat Romney 187-69 in states with 15 or more electoral votes (California, Florida, Georgia, Illinois, Michigan, New York, North Carolina, Ohio, Pennsylvania and Texas). Under the Pennsylvania proportional system, Obama’s electoral margin of victory would have been narrowed to 143-112 (with Johnson winning one), which accounts for nearly all of the difference between the actual and proposed Electoral College results. Thus, the proportional set-up magnifies the importance of smaller states by diminishing the strength of the bigger states. The Electoral College system is already biased toward smaller states — Wyoming has one electoral vote per 192,137 people versus California’s 691,663 — but under the proportional system the importance of winning small states is increased because smaller states are usually more decisive: They give a large percentage (often 100%) of their electoral votes to one candidate under the proportional format (particularly in elections with only two major candidates). A state with three electoral votes will always award those three to whomever wins the state because the two-vote bonus already gives the winner two-thirds of the state’s votes, leaving one additional electoral vote that will also go to the winner. Using the 2012 results, none of the states with four electoral votes would have split their votes either. And with most five-and-six-electoral vote states going 4-1 or 5-1 to one candidate, the proportion of electoral votes awarded to a state winner is higher than that of California, Texas or other big states. 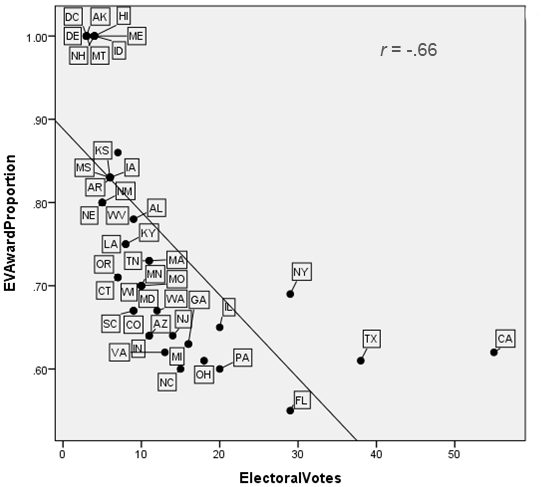 Chart 2 demonstrates the relatively strong negative correlation (r = – .66) between the number of electoral votes a state has and the size of its proportional electoral vote allocation to its winner. Generally speaking, big states would give a smaller percentage of their electoral votes to their state’s winner than small states would. For example, while California would award 62% of its electoral votes to Obama under a proportional system, Maine would give him 100%; on the flip side, Texas would give Romney 61% of its electoral votes, but Idaho would give him 100%. Therefore, if a candidate can win a large majority of the smaller states, he or she could potentially overcome slight net losses in big states. Note: Some state abbreviations are obscured on the chart. Besides increasing the Electoral College’s small-state bias, a 50-state proportional system could cause considerable confusion. Take Texas in 1992, for instance. George H.W. Bush won the state with 40.6% of the vote, earning him two votes for winning the state and giving him an electoral vote proportion of 12.2. Added together, Bush would have had 14.2 or 15 electoral votes. Bill Clinton finished second with 37.1%, for 11.1 or 12 electoral votes. Ross Perot won 22.0% of the vote, for 6.6 or 7 electoral votes. However, the three candidates’ total electoral votes would have been 34, two more than the 32 that Texas had in 1992. In the subtraction phase, Perot and Clinton would lose a vote, leaving the state’s final total as Bush 15, Clinton 11, Perot 6. With only two major candidates, the system is still fairly clear, but with three or more significant vote-getters this format could prove relatively opaque to voters. Further confusion could arise from the rounding-up provision — the bill’s language calls for the electoral vote total to always be rounded up before the subtraction phase. Technically, this means that any presidential candidate who receives a vote starts off with an electoral vote before the subtraction phase starts, no matter how small the percentage of the vote that candidate receives. While the bill clearly accounts for this technicality — during the subtraction phase, someone who won 0.1% would almost certainly have his or her one electoral vote removed in the process of reaching a state’s actual number of electors — it could still confuse the average voter. Refer back to the earlier example of Pennsylvania in 2012: Because of the rounding-up provision, technically 12 candidates would have an electoral vote (without even considering the write-in votes) before the subtraction phase. So if Obama’s portion in the Keystone State rounded up to 12, Romney’s to nine and the other 10 candidates to one apiece, we technically begin the subtraction phase for Pennsylvania at 31 electoral votes, needing to subtract off 11 to get to the state’s proper total of 20. In most cases, the third-party candidates would have their electoral votes removed — in Pennsylvania, only Obama and Romney would get votes in the end. However, third parties in the United States would likely support such a system because it holds the potential for their candidates to win electoral votes, particularly in the bigger states. If we had operated under a proportional system in 2012, Gary Johnson would have won an electoral vote in California. Although it’s only one electoral vote, one is certainly better than none for minor parties. And we only have to look back to 1992, when Ross Perot ran his first campaign, to see the kind of impact it could have outside the two-party system. In real life, Perot netted zero electoral votes in 1992 despite winning 19% of the national popular vote; in a proportional system, he would have won 59, preventing anyone from getting to 270 electoral votes (Clinton would have only won 267), thereby throwing the election to the House of Representatives. Applying the proportional format to some previous elections produces some interesting results, particularly in elections that featured more than two major candidates. Chart 3 below reviews some important elections and how they would have turned out under a proportional system versus what actually happened. Notes: Party abbreviations: (AI) — American Independent Party, (CU) — Constitutional Union Party, (D) — Democratic Party, (G) — Green Party, (I) — Independent, (P) — Progressive Party, (R) — Republican Party, (S) — Socialist Party, (SD) — Southern Democratic Party. Source: Actual electoral vote counts via Dave Leip’s Atlas of U.S. Presidential Elections. Two very close races would have seen major changes under a proportional system. In 1960, JFK won an extremely narrow plurality of the national popular vote while comfortably winning the Electoral College. But under the proportional scheme, Richard Nixon would have won the Electoral College outright. And in 2000, despite losing the national popular vote by about 0.5%, George W. Bush would have won by more electoral votes under the proportional system than he did in real life. Ultimately, it seems unlikely that any changes to the Electoral College will happen anywhere. But it’s worthwhile — and fascinating — to examine the possible repercussions of such proposals. More than anything, by laying out how a plan would have altered the 2012 election (and previous contests) we can better understand that no matter what is proposed, a “perfect” system for apportioning electoral votes to perfectly match the national sentiment as expressed by the national popular vote probably does not exist within the Electoral College framework. Most reforms have unintended consequences — while the current system has its faults, a new one might simply create more opportunities for instability and chaos. — Crystal Ball intern Aaron Shroyer contributed to this article. *Granted, if these elections had been contested under the proportional system, the candidates might have run different campaigns than they would have under the winner-take-all-system.